It's 9 p.m. on February 15, 1860, and Charles Babbage, the British Empire's most brilliant scientist, performs an experiment. Within moments, bloodred snow falls from the sky and Spring Heeled Jack pops out of thin air in London's Leicester Square. Though utterly disoriented and apparently insane, the strange creature is intent on one thing: hunting Sir Richard Francis Burton! Spring Heeled Jack isn't alone in his mental confusion. Burton can hardly function; he's experiencing one hallucination after another - visions of parallel realities and future history. Someone, or something, is trying to tell him about...what? When the revelation comes, it sends Burton and his companions on an expedition even the great explorer could never have imagined - a voyage through time itself into a twisted future where steam technology has made a resurgence and a despotic intelligence rules over the British Empire! ©2014 Mark Hodder (P)2014 Audible Inc. Even with its flaws, it is still a good read. 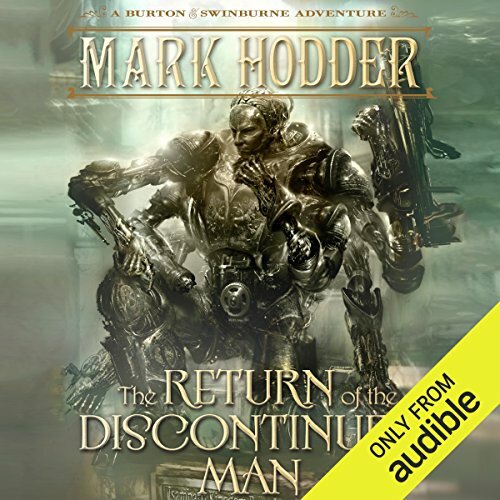 if you are a fan of the Burton & Swinburne series., Then The Return of the Discontinued Man".s well worth your time. I would recommend this book to anyone who is a fan of time travel, steampunk or sci-fi especially if they like Sherlock Holmes or Victoriana. Lots and lots of all these genres. You never know where it's going to go, which sometimes made it hard to follow especially when listening to a little bit at a time. Miss Miller! I don't think I could picture the personalities of the characters as well without Gerard Doyle. He brings them all to life. Of course I love this series it is Steampunk in its purest form. Unlike the 4th in the series this book does not stand alone. You will want to listen to the first three or you might not understand what is happening. They are trying to save the life of Edward Oxford and/or correct o riff in the time continuum. The usual suspects and the heirs are on hand for the adventures. I love this series every book goes through all ranges of emotions. This particular book, however, gets a little muddled. The time travel is a little camp and I don't expect that from this series. The timelines change so much it is hard to keep track of what is happening and what did/did not happen as a result. This story is of course fate vs free will and still has not been answered. But I guess we can see why the federation had to have a prime directive lol. Anyway it was not my favorite of the series,which continues to be The Expeditions to The Mountains of the Moon, But It still is a good listen and although it is 15 hours it goes by really fast and leaves you wanting more. In this fifth installment of the Burton and Swinburne series, strange creatures resembling Spring Heeled Jack are manifesting all over London searching for Sir Richard. Meanwhile, Burton finds himself slipping sideways in time, experiencing his life in other timelines. All this leads to Burton and his friends going on a new expedition--through time. Once again, Hodder takes multiple plot lines, unrelated events, and some amazing fantasy and works them all together into a fantastic tale. His imagination seems to know no bounds as he creates world after world for this volume. As always, his prose is good, his storytelling great, and his inventions excellent. This penultimate volume leaves the reader guessing till the very end, and anxious to start the final book of the series. As for the audio book: Gerard Doyle is a superb narrator! Not as good as the first 3 but still a good yarn. Discontinued Man is not as good as the first three books in the serious but it is still a good story. I think it is a little more sci-fi than steam punk in this one. The story seems to meander a little bit and the ending was a little disappointing, but over all still good enough to listen to. The ending was a little disappointing for me. I thought it was kind of a cop out for the author to end the book the way he did. Doyle did a great job even using a singing voice for the Brunnel voice. All the characters had a distinct voice. Did The Return of the Discontinued Man inspire you to do anything? Not really, I will be interested to see where Hodder goes next with this story. So, what will the future be like now after this story? How will we know? This series is by far superior! Without a doubt, this entire series, from The Strange Affairs of Spring-Heeled Jack to this book, The Return of the Discontinued Man, is the greatest steam punk fiction in existence! I would argue that it is not even steam punk, but rather it's own extraordinary genre! I have read many books and I am yet to find another author with the incredible story, sophistication, history, and excitement of Mark Hodder! A MUST READ! This wasn't my favorite but it's still steampunk! I really like this series overall. This book was a little far out there for me but it was still pretty good. The performance is terrific but I'm not a big fan of the Brunnell voice which is prolific in this book and really got annoying after awhile.